The absolute best pecan pie I've ever made. My family has used this recipe for years! Don't know why it's so much better than other recipes, but it truly is. 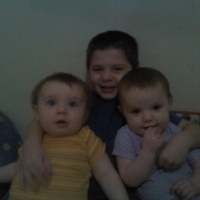 Thanks to Diane, "MadMommy" , for the wonderful picture! Combine butter, sugar, and corn syrup in a medium saucepan. Cook over low heat, stirring constantly until sugar dissolves and butter melts. Cool slightly, then add beaten eggs, vanilla and salt to mixture. Pour into unbaked pie shell and top with pecan halves. Bake 325 for 50 min. Disappointed! Too runny, not enough pecans, and doesn't have that old fashioned pecan pie taste. I am an experienced baker and have never had any problems with baking a pecan pie. This was not up to my standards at all. I will continue to use the recipe from the DARK syrup bottle as usual. We'll see...just removed from the oven. Not sure about the scant amount of pecans and thinking I should have added more. What type of uncooked pie shell do you use? Do you make your own or just buy one from the grocery store. Recipe doesn't explain this. Also, do you use white sugar, or brown sugar? I can't wait to make this for Thanksgiving (2012). Please tell me what type of sugar to use (white, brown or dark brown). Thanks Debbie! I have used this recipe a few times because my husband loves pecan pie. I want to make sure that I was using the right size eggs. Am I suppose to use large eggs or what? Have been making pecan pies for years, but this method is the secret to a fail-free pie - thanks a bunch! Wow! This is the easiest to make and it always comes out perfect! I have made this multiple times and have never been disappointed. Thank you for this great recipe! THANK YOU FOR A SUPER EASY PECAN RECIPE MY HUSBAND LOVES PECAN PIE. Making this pie as I write this and sent the son out for whipped cream to put on it ! lol ! It sounds DIVINE ! OMG !!! This is THE MOST AWESOME PECAN PIE !!! I've never been able to get any pecan pie I ever made to "set up" but this one set up beautifully!! Thank you thank you,thank you for this post ! Hi Debbie! I just made your pie and I can't wait to dig in!! 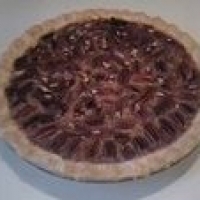 It was so much fun - as this was my first homemade pecan pie. I took a picture of it, but I wanted to ask your permission before I just threw it up there. Would it be ok if I posted the pic? This looks like a great Pecan Pie! This looks really simple and easy, and I am SUCH a sucker for a good pecan pie. Thanks for the great recipe. Oh yes, the best, made it for years, thanks for reminding me.. Printed out and using right now. Thanks for the post. Can't wait to try it. My Dad grows his own pecans so it should be wonderful. Happy thanksgiving.